We have a sign! 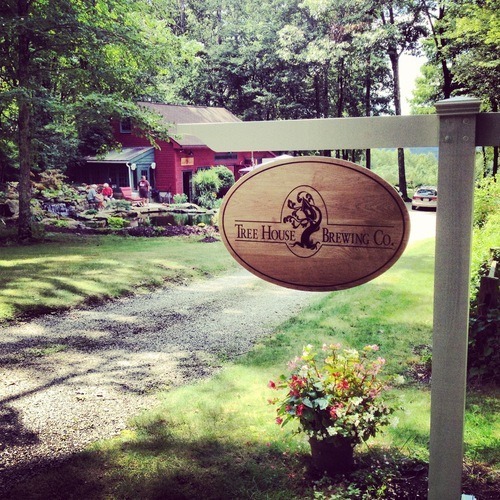 (And other musings) — Tree House Brewing Co. In an effort to make it less impossible to find us, we’ve finally put up a sign. It was a great Saturday at the barn. It started out a bit rainy, but morphed into an amazing, dry, late summer day. We had a good deal of guests including two fellow brewers from nearby breweries and friends from as far as Boston. The first keg of Julius, as expected, lasted just a few hours. We attempted to rig a conversion on a restaurant keg to keep it flowing but it suffered from foam issues. No fear, the next batch will be ready in a few weeks! “That’s What SHE Said” replaced it and should pour for a couple weeks. “Rapture” poured for the first time in the retail shop and appeared to quickly gain favor. There should be a fair amount of this next weekend if it tickles your fancy! We are working hard on plans for a new draft system to ensure quicker pours for growler fills and enable sample flights to be poured simultaneously. We appreciate your patience as we grow and try to keep your experience as great as possible. Stay tuned as we work to solidify next weekend’s offerings!